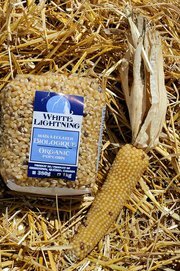 White Lightning Organic Popcorn, grown by the good folks at Tullochgorum Farm in Ormstown, Quebec, is unique. Not only does it pop a beautiful, bright white, unlike the usual yellow popcorn, it also « possesses a delicate, crispy texture, and a slightly nutty flavour vastly different from the more common popcorn varieties, and worlds away from microwave popcorn »! White Lightning is grown less than 100 miles, if you take the crow’s route, and is only available locally at our Saturday vegetable stand at the Boulangerie aux deux Frères. We are very pleased to make this one-of-a-kind snack available to food lovers in Aylmer and region. For some interesting (and shocking) organic popcorn facts, click here. Please see the farmer’s Facebook page for more information.